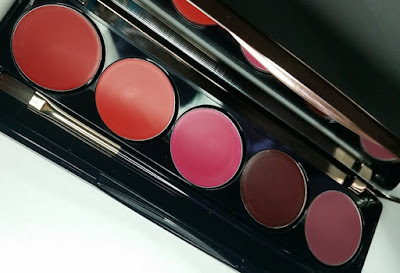 To apply these lipsticks for the review and the swatch photos, I used the brush included within the palette. As with all other lipsticks, it's easiest to begin by drawing a V in the middle of the upper lip for the perfects cupid bow and continue from there. Application is pretty much the same for all of the shades in this palette (except for one which I'll mention briefly in a moment). All of the shades seem to apply sheerly and a little streakily when using the brush. This results in it taking a while to neaten out the finished look and to have bold colour. If you prefer the sheerer finish, you can blend out any streaks using your finger and rock it that way, but if you do want the bolder colours you may be building it up for a while. The only shade I didn't have much trouble with was Rose Sompetueux which was bolder far faster than the others. To work out whether or not this was down to the formula or the brush, I also attempted to apply them on a different occasion with my finger instead. This resulted in a bolder, less streaky finish in little to no time. It has more of a natural look to it as well that comes across as more of a wash of shade rather than a slick of it (if you're following me). The issue with this type of application though is that the edges don't look as smooth. I think the best way to go is to have a play with different methods of applying these shades from the pan to find what look you like best. Applying the outline with the brush and filling in with your finger is an option, or pulling out lip liner to line and your finger for the rest. Either way, the finish is a nice one. Out of the bunch, my favourite shades are Rose Somptueux and Mauve Subtil. For a bolder shade, I like Rose Somptueux because it has great pigmentation and glides onto the lips well. For a more subtle look, I adore Mauve Subtil. Whilst it looks quite sheer in the photo, it's actually more pigmented than it appears. It blends onto the lips and allows juuuuust enough of your natural skintone to come through to create a beautiful, casual, mauve glow. This is the type of lilac lipstick that I personally love the most. I find the wear time to be similar for each of them and that came in at around 2-3 hours. With Mauve Subtil, it was around 2 hours for vibrant colour, but it did wear for a few hours with a more muted version of itself which actually still looked nice and not in a "oh she needs to re-apply that lipstick" kind of way at all. 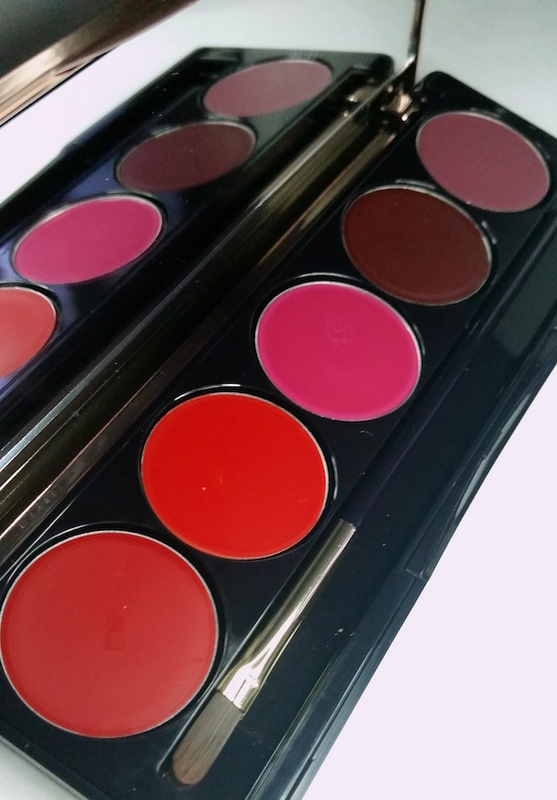 Formula wise, these lipsticks are pretty hydrating and feel more like a lip balm than a lipstick when on. They're lightweight and silky, so I agree with the claim about forgetting that you're wearing it. I honestly have forgotten on multiple occasions until I've caught myself in the mirror and I'm like, "ohhh yes, I forgot I was wearing a bit of lippie!". Overall I do like this palette. I think that you need to have a play around with it to work out the best method of application and once you find it you'll be flying. I don't recommend using it if you're short on time if you are using the included brush as it will take you a little longer to achieve the perfect look, but if you have the time or if you go with another method it is worth the effort. 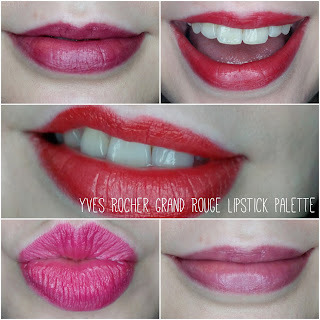 You can purchase the Yves Rocher Grand Rouge Lipstick Palette from Yves Rocher. What are your thoughts on the Yves Rocher Grand Rouge Lipstick Palette? What is your favourite shade? 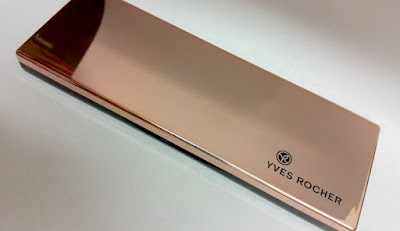 *This particular item wasn't sent as a PR item to review, but it was sent as a gift from Yves Rocher.